Knee pain is something many runners experience. 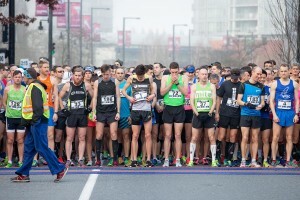 And although masters runners worry about developing osteoarthritis as they get older, physiotherapist Chris Napier of Restore Physiotherapy in Vancouver says knee pain in runners is more likely due to other causes that are relatively easy to treat. First, some definitions. Arthritis is an umbrella term referring to pain and swelling in the joints, but there are actually many different types and causes. The most common form is osteoarthritis, which refers to the effects of loss of the squishy cartilage that cushions joints. 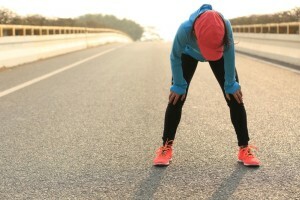 But contrary to non-runners’ widely held belief, it’s not caused by running. In fact, running may even have a protective effect. Napier doesn’t see a lot of arthritis of the knee in his patients who run, even among masters runners. “I do see the odd person who has some degree of arthritis and can potentially run through it,” Napier says, “But it’s not one of the major injuries I see.” And although he does occasionally see arthritis affecting the joint of the big toe as well as the knee, Napier says the main cause of arthritis in the lower extremities is not running, but genetics. Maintaining an active lifestyle and a healthy weight (which runners generally do) are key to preventing and managing arthritis pain. To diagnose and treat knee pain in runners, Napier suggests a physiotherapist would look at things like their training load and history (noting any recent spikes in mileage or intensity) and their injury history. He would also strongly recommend a strengthening program, since loss of strength is a major cause of injury in aging runners, including squats, deadlifts, and heel drops strengthen your quads, glutes, hamstrings and calves. “Research suggests going for heavy loads and low reps when lifting,” Napier says, which means lifting heavy enough that you can do six to eight reps, but not 12 or 15. Go for three or four sets. Napier suggests lifting in front of a mirror and having someone watch you to check your technique. (Another way to figure out how much weight to lift is to find the heaviest weight you can lift for one rep, and start with half that.) As you get stronger, progress to heavier weights, continuing to check your form as you lift heavier and become fatigued. And if your knee pain persists? A physiotherapist might then analyze your gait and any possible asymmetry (here’s where your injury history can be helpful).